Long hair is super trendy and versatile. Longer lengths are flirty, feminine and can be worn up or down a variety of ways. Women with round faces can still pull off a longer hair with the right cut and styling. 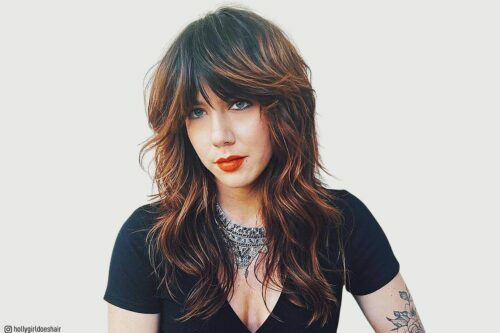 If you’re looking to add volume as your hair gets longer, consider adding in layers. Below, you’ll find some of the best long hairstyles for round faces that will slim your face and enhance some of your best features. Rock out a flowing mane by taming it with multiple layering! Now you can enjoy being a long-haired gal with a multitude of styles that you can explore. I love to think of this style as the modern-day version of a long layered cut with added fringe bangs. I attempted to keep brightness around her face by adding babylights near the front hairline – somewhat similar placement to where young girls have their particularly blonde natural “sunlights.” Highlighting these areas on any natural blonde is my favorite coloring technique. I strongly believe any face shape can be improved with the addition of bangs or framing around the face. It typically can soften a strong check-bone or jawline, yet can create more flare for those with round or oval face shape. I recommend a roost boost for gaining volume when styling this area of the hair, and possibly a sticky serum or wax (Bumble & Bumble Brilliantine for example) towards the tips to keep fringe from becoming “box-like” or heavy. This look is a polished shag. It has the same layering pattern and fringe as a shag but cleaner and longer. My favorite thing about this is the fringe. I just love how it frames her face and gives her the ability to wear it straight across or parted for a more casual look. This look is fairly low maintenance aside from touching up your fringe in the morning. I like to wet, then use a little leave-in conditioner to make the hair more pliable. My favorite is the Nourishing Detangler from Emera. Then blow dry in a criss-cross pattern to break any cowlicks or bead head so the fringe will fall across the forehead evenly. This is a long layered haircut. I love the depth at the roots and how the color fades and lightens up around her face to brighten her complexion. The long layers help her to wear it natural without being too heavy. This client wanted low maintenance. I used R+Co’s detangle spray and moisture cream on damp hair. I recommend drying the hair with your fingers until about 80% dry, focusing on cowlicks and lifting the hair off the roots and where you want to create volume. Once almost dry, smooth the hair with a round brush. 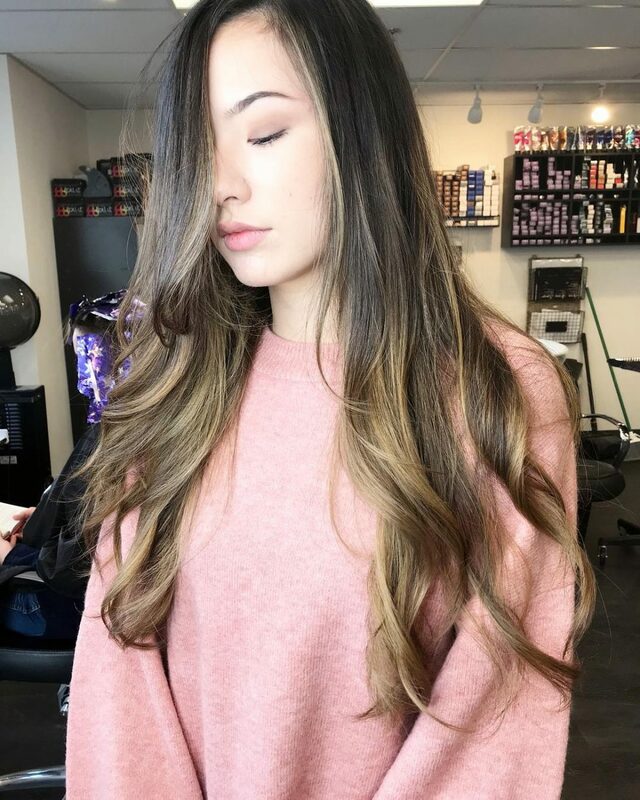 I would describe this as a rooted balayage look. It is great for guests who want to stay blonde without having the normal six to eight week upkeep. My favorite thing about this look is the seamless blend from root to end. You can still be a blonde without having the harsh growout/demarcation line! In order the achieve this look, I did tiny babylights all over in foils with Framesi lightener + 30 vol. I balayaged all of the ends leftover with the same lightener + Olaplex so her ends would be brighter. I let all of that process until it lifted to a very pale yellow. I then rinsed out the highlights with Oligo blue shampoo to cut any brass prior to toning. I toned her roots (about the first two to three inches) down with 1/2 6N + 1/25N in Redken for about five minutes while leaving the hairline out around her face for that bright pop of blonde. I then toned the ends with 9V + 9P in Redken to cut any leftover brass. This look is great for someone who wants a lower maintenance hair color. 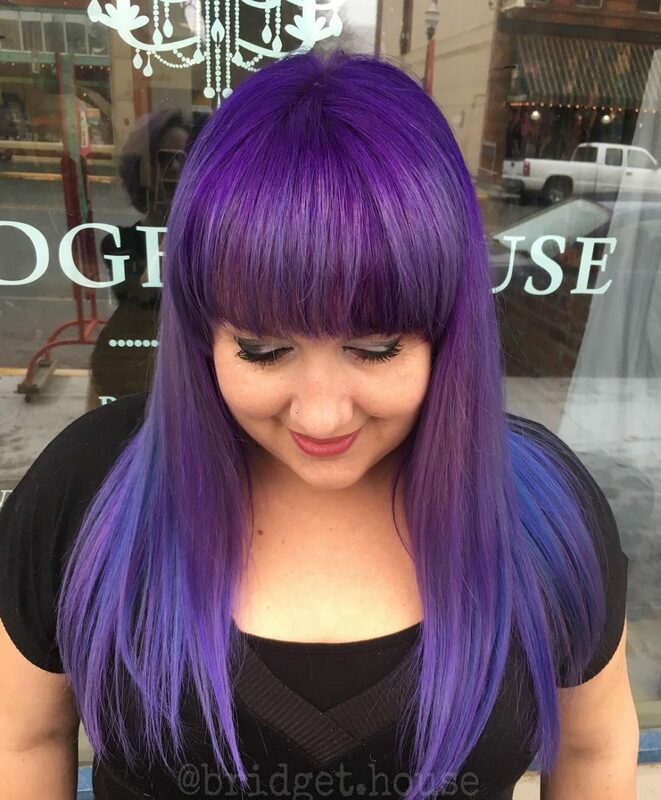 There are many different versions of this color, but it can be done on many different hair types. I recommend good haircare at home with a heat protectant and oil for moisturizing the ends to keep the integrity of the hair. Investing in a good shampoo and conditioner is also very important. I would describe this look as an effortless, natural, beachy look. The highlights are placed and meant to bring brightness and dimension to the natural hair color. The light pieces in the front pop and bring emphasis to the face, while the lightness at the bottom brings attention to the length. The cut is blunted on the ends to make the hair look fuller and thicker, while the layers are shattered and seamless by taking weight out of the interior. I wanted the cut to feel lived-in and effortless. My favorite part about this look is the different layers of dimension with the color and the way the color flows. It makes the client shine, enhances her hair color, and even adds a little bit of texture to a simple style. When considering this look, it is important to consider the tone of the color and its placement. Correct placement will ensure that the color grows out naturally and frequent touchups aren’t always necessary. Choosing the correct tone of blonde is also really important. The wrong tone can bring out unwanted colors and features in the skin, especially if it pops next to your face. This color and cut are meant to be long-lasting, easy to style (with options), and effortless, so it’s perfect for the minimal styler or the on-the-go woman. The cut (depending on texture), should encourage volume and movement at the right parts of your face to create angles, but it should have a strong line so it lengthens a rounder-shaped face. Being a hairstylist has given me the opportunity to help clients let their beauty shine through a flattering hairstyle. Every person has unique traits that are beautiful and individualistic. This specific client has long hair that tends to fall flat because she has so much hair. By adding layers, and strategically removing weight, the layers effortlessly fall into place. They are beautiful and bouncy and will look good whether she curls, straightens, or simply air dries her hair. If I client is considering this look, they should first make sure they have enough hair to accommodate the necessary weight removal needed to create all the various layers in this swelling technique. This particular cut works best for clients with dense hair and an oval face shape. When it comes to styling this look, I would recommend blow drying with a round brush and prepping the hair with a volumizing mousse, a heat protectant, and an amplifying blow dry cream. 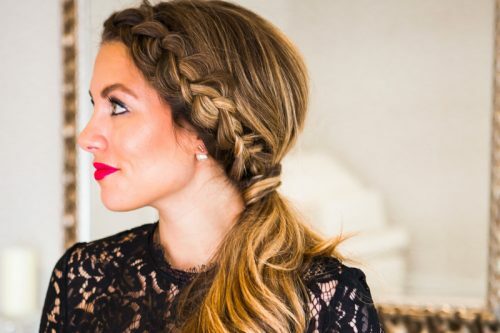 This look is very versatile because it leaves enough hair on the head to allow for a sleek and professional top bun by day, and big, glamorous curls by night. Also, this look can easily be pulled back into a ponytail for those on the go and in need of a quick ‘do. This is a soft, natural look in layers. It is perfect for those who want length and a “pow wow” look! My favorite thing about it is that the client doesn’t need a ton of products or lots of time spend styling to get this look. If you want a look that’s easy to maintain and looks good when it’s down or in a ponytail, this cut/style is for you. This look is also ideal for those who crave movement in their hair but want to maintain the length. When creating this look for a client with a round face, the layers in front should start a few centimeters below the chin. This look is for a client who loves to be blonde but wants a softer upkeep or lower maintenance growout. 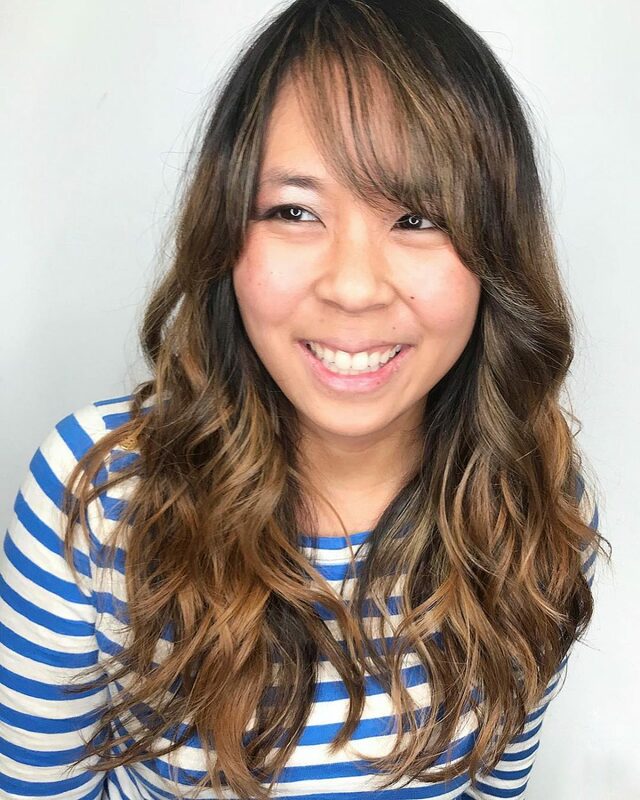 My client travels from Virginia to New Jersey a few times a year to get her color and cut done, so the overall goal is to keep it as blonde as possible but have the color last until the next time her schedule allows her to travel back. She still gets compliments MONTHS after her service! I love the long, swept back bangs for almost any face shape, and the fun part is changing the length to customize the cut for each client. For this look, we kept the bang longer because of her round shape and also so she can flip from side to center part when necessary! She is a mom of two young kids, so the length also helps for an easy top bun or pony. This look is simple to style on a daily basis or can easily air dry with the layers and face frame! The styling for this look was done with Arrojo Styling Whip, Set and Style Spray, Working Spray, and a Bionic 1 1/4-inch curling iron. This look is a long modern shag with soft caramel waves. I love the effortless style this look provides. It complements any texture and is customizable to fit any face shape. This look is perfect for anyone who desires a low maintenance, modern silhouette. I recommend using products that enhance natural texture while simultaneously controlling frizz such as Aveda’s Nourishing Styling Creme. This look can be styled very easily by air drying or with light blow drying. I also love enhancing the ends with a curling iron! Balance your face shape with a matching center-parted lob! It’s simple yet effective in making you look cute all day! I would describe this look as a classic long hairstyle with texture and movement. My favorite thing about this look is the texture and how it creates movement to give a natural, soft look. I would advise using a heat protecting product before smoothing the ends. Add Loreal Hollywood Waves Siren Waves on dry hair, then use a 1 1/2-inch curling iron to create soft beach waves, alternating the direction of each curl. Next, use Loreal Next Day Hair generously to create the textured look. Finish with a small dab of Loreal Mythic Oil to create separation on the ends. I wanted to keep the bang a bit long so it can go into a ponytail and to get a soft face frame. Her hair type is thick and between straight and wavy. I did a dry point cutting technique to get more texture and movement. This haircut works well on medium to thick hair and for women that like natural soft texture and movement. The bang can be shorter or longer depending on the face shape and lifestyle. This is a full, eye-grazing fringe. I love this look for people with high foreheads. The length of the bangs draws your eye to the client’s eyes, making them the focus. If you have a full or round face, make sure the fringe angles down on the sides. This gives your face a thinner appearance. 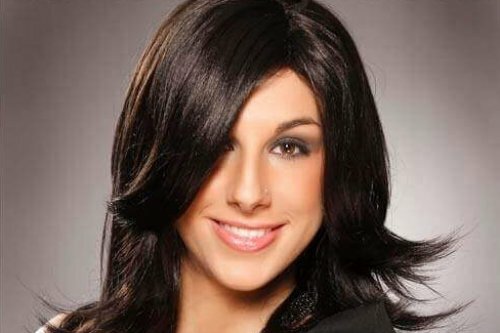 This style works best for straight hair, whether naturally straight or styled that way. I would call this a pretty, low maintenance style with long layers and longer face framing. I think it looks really great on girls with very long hair. Depending on the client, I can do a little or a lot of dry cutting to create texture. Girls with curly/wavy hair will like this style because it is so low maintenance. The hair won’t look super bulky at the bottom, instead, it will be moving in more defined waves/curls. When they want to air dry their beautiful locks, some hair oil or cream for curl/texture (or even a salt spray) will be a great styling product. This look is very soft. The shorter face frame in the front helps open everything up and give the look more movement. Given the varying lengths throughout the cut, I recommend it to anyone who naturally has straight or wavy hair. I would use a leave-in conditioner and argan oil when the hair is wet, and a styling paste after the hair is dry for hold. 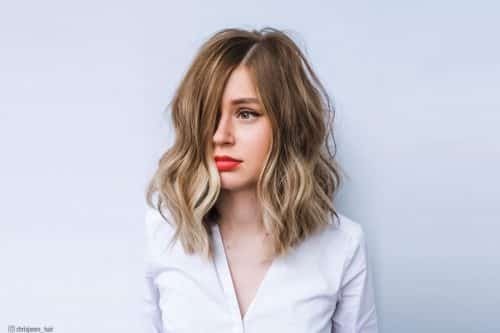 This long layered cut with rooty balayage highlights beautifully frames the face and is a great way to create an optical illusion with any face shape. The dimension the highlights give against a darker base can help “contour” the face by drawing attention to areas with lighter pieces and creating shadows in other areas to give depth. This look is sunkissed and natural, like a little girl’s hair lightened in all the right places. The most wonderful thing of all? It has a gorgeous growout with minimal upkeep! I always recommend a sulfate-free shampoo for any hair that has been colored. It really helps maintain the color longer. As for styling products, I really love “It’s a 10” on the ends of lightened hair as a heat protectant to seal and help with the overall integrity of the hair. 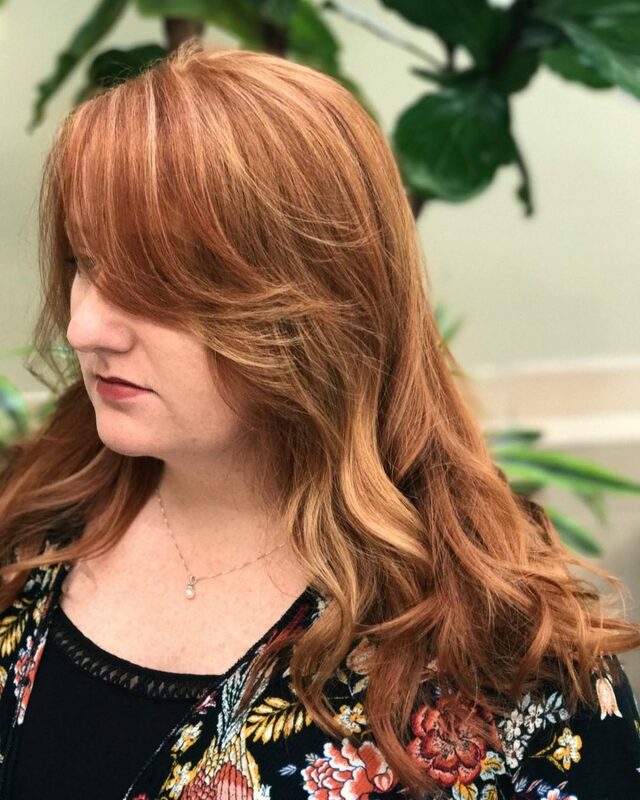 Kenra Uplifting Foam is awesome for giving airy volume at the roots and Redken Velvet Gelatin blow dry gel was used mid-shaft to ends to smooth the cuticle of the hair, to give it memory, and for a cushy bounce. We finished off with Kenra 13 for a lightweight, movable hold. This look is perfect for heart shaped and round faces. The long layers slim and frame the face while the highlights and lighter ends make the face appear longer. Also, for anyone wanting to ease into highlighting or hair color, this is a way to do it while looking natural and not too obvious. 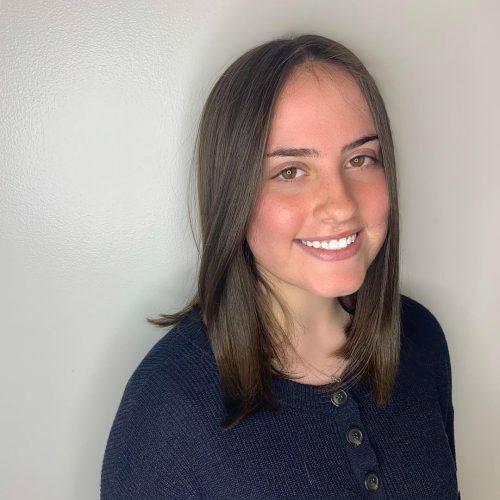 This look is great for college students, ladies who love the organic “rooty look”, or anyone that just wants something more low maintenance than an every four week appointment. They are all in love with this style! I would describe this look as something laid back yet chic. My favorite thing about this cut is you can wear it any way you want. Messy, classy, up or down, this is a look that can look appealing to any mood. I recommend TIGI Catwalk’s Bodifying Spray for hold and fullness and TIGI Bedhead Joyride to give the waves a relaxed look. Anyone that loves their hair long will love this cut. It’s very easy to maintain!